Guide4WDW.com: Why You Should Attend the Momentum Workshop Weekend with Lou Mongello! 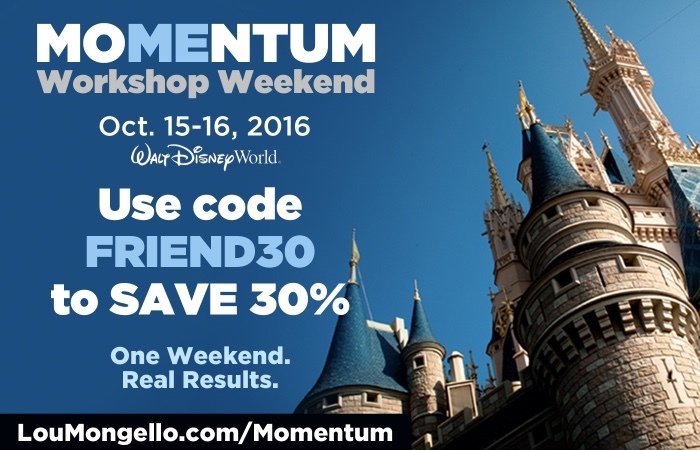 Why You Should Attend the Momentum Workshop Weekend with Lou Mongello! I knew I would write this post eventually, but I didn't know quite when. So, today we’re going to tell you a little bit about how the site began. Over a year ago, I began writing a book, or I should probably say I began thinking about writing a book. Unfortunately though, it was one of those things that seemed like a great idea, but I had no idea where to start. Thankfully, I had began listening to the WDWRadio podcast (available on iTunes) quite a few months before and kept hearing Lou Mongello talk about how he tried something new and it became the occupation that he loves. If you haven't listened to his podcast, I highly recommend it for any Disney parks fan. But, as you can imagine, we aren't really here to talk about the podcast but rather the result of the podcast. After listening to one of the shows, I picked up on something I had never really paid much attention to before. At the end of the show Lou simply referenced that he would be happy to help anyone learn how to achieve their dream and start something new that they would enjoy each every day. I didn't think much of it, but went ahead and sent him an email to see if he would have any tips on how to start writing a book of my own (Lou Mongello is the author of many Disney Parks books). To my surprise, he responded to the email and recommended a specific site to help the design and publication process. Believe it or not, the end result was my book finally getting written. He was more than helpful and the simplest of advice allowed me to do something that I enjoyed and make a few dollars along the way. Today, that book has developed into a website and hopefully the site will continue to grow over time. After I created the blog (hopefully soon to become a full-on website), I invited Caitlin to start writing with me to create more content for you to enjoy. Hopefully we’re moving in the right direction and if there’s anything you want us to post about in the future feel free to let us know below! Fortunately, I tell you this story for a reason! If you want to do the same thing, develop a similar concept, or have an idea that you want to turn into a business no matter how big or how small, be sure to look into the Momentum Workshop Weekend hosted by Lou Mongello himself! I guarantee that he can help make your idea into a reality. He helped me personally through just a few emails (that he didn't even really have to respond to), so I can only imagine what he can do throughout an entire weekend. Discounted room rates are available on a first come first serve basis (contact Lou or click the banner below for more details). If you are convinced already that you want to go and turn your dream into a reality, be sure to use the code “FRIEND30” for 30% off the cost of the event!